Thank you to Chef Tony Briggs from Certified Angus Beef for his idea of braising the brisket in root beer for this recipe. The root beer adds a wonderful sweet note to the beef and it’s fantastic!! In a medium to large sauce pan, heat the one tablespoon of oil over medium high heat and add onions. Sauté for 3 minutes, reduce to medium and add tomato paste. Stir while cooking for one more minute. Add wine to deglaze the pan and reduce by half. Add beef stock, Worcestershire sauce and bay leaf and reduce to four cups. Set this mixture aside. In a large Dutch oven over medium high to high heat, add oil. Thoroughly pat the beef dry with paper towels and season all sides with salt and pepper. Add pieces one at a time to the hot oil keeping the pieces from touching. Brown each piece on all sides, about 2-3 minutes per side. Let each side sit untouched until you are ready to turn so they get a nice crust. Add root beer and deglaze the pan. Add peppercorns, cinnamon stick and reserved reduced liquid. Cover and place in oven and set timer for four hours. After four hours, check liquid and add more root beer if needed and continue to cook until tender, about another hour. While brisket is cooking, prepare the filling. In a medium skillet with a tight fitting lid, place the two teaspoons of the oil and heat over medium high. Add mushrooms and salt and cook covered for about five minutes. Mushrooms should give up some liquid. Uncover and cook for about five more minutes until liquid is gone and mushrooms become golden brown. Remove to a large bowl and hold. In the same pan heat the last teaspoon of oil and add onions and garlic. Cook uncovered for three minutes or just until they start to brown. Add these to the bowl with the mushrooms and refrigerate for later. Once the beef is cooked, remove from heat and let rest in the pan uncovered for 10 minutes. Remove each piece to your cutting board and slice against the grain. (reserve pan sauce and place in refrigerator until later) Then with your fingers, crumble the slices and add to the now chilled bowl of mushrooms and onions. Chill this mixture for at least an hour. To the same bowl add the diced provolone and ½ cup of the reserved pan sauce (skim off any fat first). Mix this final mixture thoroughly. In a small bowl, beat egg white with water. To assemble, brush all four edges with the egg white mixture and place about 1 ½ ounces of filling in center spreading it out in a line from left to right, with one of the four corners pointing towards you. The amount of filling will exactly fill 20 wrappers. Roll the corner closest to you over the line of filling and tuck under filling. Then fold each edge to the center, tucking under the roll you started. Finally roll forward until it ends with the opposite corner under the eggroll. 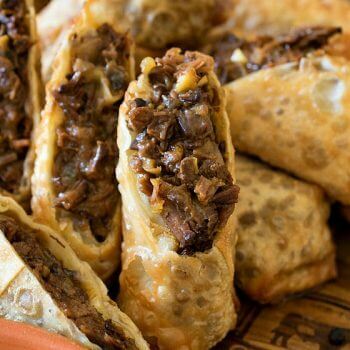 The queso is easy to make and better if you make it before frying so the eggrolls can be eaten hot and crispy. If the queso cools off, just microwave to melt again. In a small sauce pan, place diced chilies and add all of the American cheese, breaking it up with your hands. Add 1/8 cup of any beer and heat over medium heat until melted. Only use another 1/8 cup or less of beer to get the queso to your desired consistency. In a cast iron skillet or wok, heat enough oil to cover the cooking eggrolls. Once the oil is 350 degrees (use a candy thermometer), cook the eggrolls in three or four batches until crispy. They float so try and keep them submerged so all sides get crispy. Remove to paper towels and serve with hot queso dip.